Pets N More: Why Are Certain Popular Dog Breeds Dying So Much Younger Than They Used To? 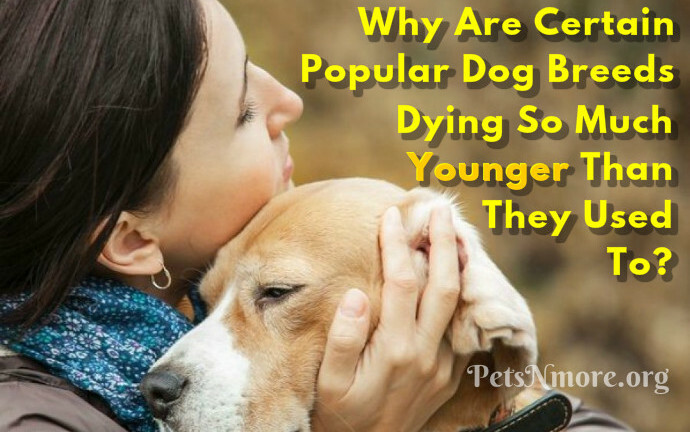 Why Are Certain Popular Dog Breeds Dying So Much Younger Than They Used To? The 2014 Pedigree Breed Health Survey is the largest of its kind to date, sent to 385,000 owners of 215 different breeds. Responses were received from owners of 191 breeds, representing over 43,000 living dogs and over 5,600 deceased dogs. This means the median longevity of Britain's purebred dogs has dropped by 11 percent in just a decade. Why Are Purebred Dogs Dying Younger? "It seems strange that in this era of improved nutrition and better medical care, dogs are living shorter lives." As described by Jemima Harrison, writing for Pedigree Dogs Exposed, it's really not strange at all. "More than 85 percent of KC registered dogs today do not make it to old age — and almost all die, or are put to sleep, because of disease." Per Harrison, the new revelations from the survey shouldn't come as a surprise. The idea that mutts are healthier makes a certain amount of sense when you consider the poor breeding practices of puppy mill operators and many AKC-associated breeders as well. There's excessive focus on breeding animals for certain physical characteristics, and entirely too little attention paid to selecting dogs for health and longevity. The belief that breed-blending creates healthier dogs is part of the reason "designer dogs" like Goldendoodles, Morkies and Puggles have become so popular. It's also why breeders are able to ask inflated prices for dogs that aren't purebred. But are mixed and designer breeds really healthier? Not according to what many veterinarians see in their practices, and not according to a five-year study of veterinary cases at the University of California (UC), Davis. This research indicates that mixed breeds don't automatically have an advantage when it comes to genetic disorders. The UC Davis researchers looked at the records of over 90,000 purebred and mixed breed dogs that had been patients at the university's veterinary medical teaching hospital between 1995 and 2010. Designer dogs were included in the study, since crossbreeding is presumed to reduce or eliminate genetic disorders like hypothyroidism, epilepsy, hip dysplasia and cancer. According to the study, the prevalence of 13 of the 24 genetic disorders was about the same for purebreds as mixed breeds. Ten conditions were found more frequently among purebred dogs, including dilated cardiomyopathy, elbow dysplasia, cataracts, and hypothyroidism. One disorder was actually more common in mixed-breeds — cranial cruciate ligament ruptures. The researchers concluded that overall, the prevalence of genetic disorders among purebred and mixed-breed dogs depends on the specific condition. The UC Davis study data also suggests breeds that share a similar lineage are more prone to certain inherited disorders. Rottweiler, which are all from mastiff-like lineage. This suggests these breeds share gene mutations for elbow dysplasia as the result of having a common ancestor. The flip side of the coin is that disorders that occur in both mixed breeds and purebreds seem to originate from well-established gene mutations that have spread throughout the dog population. If you're thinking about purchasing a purebred puppy, I've developed a method to help you determine how healthy your new pet may be. Investigating the lifestyle of your prospective puppy's parents through questions posed to the breeder can give you excellent insight into the health of your pup and his littermates.